What to bring your relatives in Papua for Idul Fitri to celebrate the end of the fasting month of Ramadan? What about a freshly baked pizza from Pizza Hut brought all the way from Jakarta? Will his relatives ever come for a return visit? 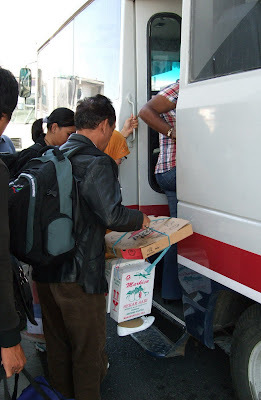 Photo taken at the transfer airport at Makassar, September 2008. And if the delivery time is too long you get the pizza for free.